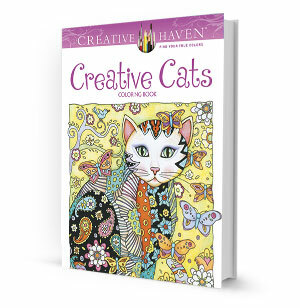 Featuring more than thirty fancy feline designs, this Creative Cats Coloring Book provides endless opportunity for experimentation with color and technique. Adorned with everything from paisley patterns and flowers to music notes and sophisticated accessories, this collection will satisfy the colorist and cat lover alike. The award-winning author and illustrator Marjorie Sarnat breathes new life into the Art of Coloring, through the intricate interweaving of exotic cats with mesmerizing eyes that entrance you, and captivating, unparalleled combinations of patterns embellishing the backgrounds, scenery, borders, and even adorning the cats. Her art is brilliant in conception, skillfully and meticulously executed creating phenomenal artwork that will inspire you and take your creativity to new levels!